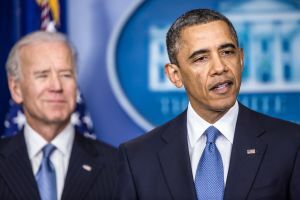 By Louis Jacobson, Molly Moorhead on Wednesday, January 2nd, 2013 at 4:42 p.m.
President Barack Obama, with the help of Vice President Joe Biden, forged a compromise with Congress on taxes. Barack Obama, when he ran for president in 2008, promised to raise taxes on the wealthy. He campaigned for higher income taxes, higher capital gains taxes and fewer loopholes benefiting the rich. Republicans in Congress fought him on tax increases every day of the last four years, but then the fiscal cliff crept in like a storm cloud threatening to deluge the country’s economic recovery. Twenty-three hours past their deadline, Obama and congressional Republicans finally forged a deal to avert the cliff. That got the needle moving on the Obameter, where PolitiFact tracks hundreds of promises Obama made during the 2008 campaign. In the legislation, formally known as H.R. 8, Obama did get a tax hike on high incomes. But he didn’t get everything he wanted. The centerpiece of the deal is a change to income tax rates. The law will raise rates permanently for families with annual income above $450,000 and individuals above $400,000. Incomes below those amounts will remain at the current rates, which were set during President George W. Bush’s term. Obama promised to keep those rates in place for families making less than $250,000 and individuals making less than $200,000 a year. On the flip side, he promised to raise taxes for individuals and families above those thresholds. So Obama kept his pledge to extend the lower rates for lower incomes, which merits a Promise Kept on the Obameter. But he had to give a little on the dollar figures in repealing the low rates on higher incomes. That rating: Compromise. Obama also vowed to increase capital gains and dividends taxes from 15 percent to 20 percent for those making more than $250,000 (for couples) or $200,000 (for individuals). The fiscal cliff bill raised those taxes to 20 percent, but only for taxpayers earning $400,000 (for individuals) or $450,000 (for couples) and up. So the deal executed most of what Obama promised on capital gains and dividends, but it did so only above a higher income threshold. We rate this a Compromise. In 2008, Obama promised to limit personal exemptions and itemized deductions for high-income tax filers. These provisions were in force in the 1990s, but were minimized under Bush and eliminated by 2010. The fiscal cliff bill did something very close to what Obama pledged in 2008, bringing back the Personal Exemption Phaseout, commonly known as PEP, as well as the "Pease limitation." We rate this a Promise Kept. After years of incremental fixes, lawmakers made a permanent amendment to the Alternative Minimum Tax within the fiscal cliff deal. The AMT, as it is commonly known, it is a separate income tax calculation that was intended to ensure that wealthy people did not use loopholes to avoid paying taxes. Once taxpayers reached a certain income level, they needed to pay the amount calculated under the AMT even if the deductions and exemptions available under the regular tax code would otherwise allow them to pay less in tax. But the AMT, unlike the standard tax code, was not indexed for inflation. So, every year, more and more Americans hit the threshold and found themselves owing higher taxes. As a result, the AMT was increasingly becoming a burden on the middle class, or at least the upper-middle class, rather than the rich. In recent years, lawmakers have "patched" the AMT in a way that kept it from hitting many non-wealthy taxpayers. But this produced regular headaches for lawmakers. The fiscal cliff bill ends the need to regularly patch the AMT by permanently indexing it for inflation. We rate this a Promise Kept. In revising the estate tax law -- another long-running battle -- Obama and congressional Republicans met in the middle. Obama wanted to exempt the first $3.5 million in value of estates and impose a top rate of 45 percent. When the fiscal cliff deal was negotiated, Obama had to yield on those numbers. The fiscal cliff bill set the top tax rate at 40 percent -- halfway between Obama’s pledge and the reported 35-percent rate favored by some Republicans -- and estates smaller than $5 million will be exempted. Going forward, that $5 million limit will be indexed for inflation. Given that both sides had to give ground here, we classify this as a Compromise. Also see related fact checks.